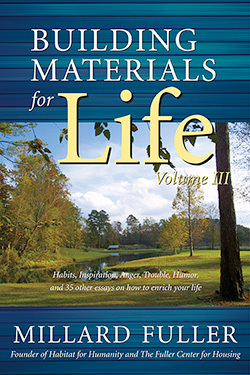 This collection of 40 essays completes the series Building Materials for Life, which includes three volumes and a total of 120 essays. In volumes I and II, Millard Fuller writes about topics such as learning from failure, staying healthy, prayer, worship, humble pride, hope, commitment, sorrow, and passion. Volume III includes essays on habits, inspiration, anger, trouble, humor, and thirty-five additional topics. As in the first two volumes, the essays deal with both religious and secular subjects, and everything is relevant to daily living. Fuller's fervent hope is that this volume and the entire series will be helpful to people in dealing with questions and issues that arise in life.